"Did you buy any toilet paper, mom?" Why does your cat enjoy shredding paper products like toilet paper, tissues and paper towels? In short -- because it’s fun. Cats often use shredding paper as a way to relieve boredom, according to feline behavior expert Pam Johnson-Bennett. 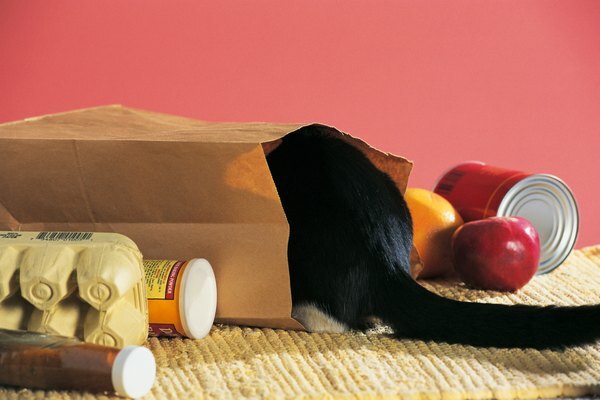 With basic lifestyle changes, you can alter your cat’s chaotic behavior. In the majority of cases, cats tear up paper due to boredom. Your frisky feline may find it rewarding to peel off pieces of wallpaper in your dining room or to shred the toilet paper in your bathroom. Boredom can generally be avoided by scheduling in daily play sessions with your cat. In some cases, anxiety is to blame for your pet’s bothersome behavior. If feline stress is causing your cat to shred paper, consult with your vet about the best route for diminishing the problem. Cats have a natural hunting instinct and your prized paper doll may be your little Tiger’s next victim. To avoid these mishaps, provide plenty of toys to keep your cat busy. Simulate a hunting scene by attaching a toy to the end of a fishing pole, allowing your cat to stalk and ultimately capture his prey. Offer your pet toys filled with tasty treats, as these provide a challenge for cats. If your cat simply must have paper, give him the paper of your chosen. For example, create paper bag tunnels for your frolicsome feline. If you catch your cat wreaking havoc on your home’s paper supply, attempt to diminish his interest. If your cat has a favorite area of wallpaper that he loves to tear, place a piece of plastic sheeting along the floor in front of the wall. Cats dislike the feeling of walking on plastic. Be clever in your attempts to deter your cat away from paper, such as placing a small cup of water on top of the toilet paper roll. If all else fails, it may be necessary to close off the location in which your cat is creating the mess. While tearing up paper is usually a harmless habit, your cat may begin eating the paper that can result in internal blockages. If you notice your cat chewing or ingesting paper products, consult with your vet as this may indicate a dental problem or nutritional deficiency. In more severe cases, your vet may recommend declawing your cat if he tends to use his paws to shred paper. When destructive behaviors get out of control, your cat may need professional help from an animal behaviorist. Do Cats Have Nerves in the Nails? Why Do Cats Thump on Toys with Their Back Feet?